Grant Approval 360 Reviews - Legit or Scam? Grant Approval 360 Reviews – Legit or Scam? 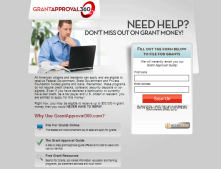 Grant Approval 360, found online at GrantApproval360.com, is a website dedicated to helping regular Americans apply for government grant money, regardless of their credit score or general financial status. According to Grant Approval 360, all American citizens are eligible to apply for and receive Federal and State grant money, and they can show you how to apply for this money at no cost to you personally. All you need to do in order to receive your Grant Approval Guide is to give Grant Approval 360 your first name, email address, and take a few minutes to go through their brief questionnaire. In reality, a grant is money given by the Federal or State government in order to fund specific projects, which must be outlined and approved, then managed and closely monitored by the agency which has given you the funds. Grant money is in no way intended to help you pay off your personal financial obligations. Websites that act as though the government is simply handing out money to people to do with what they wish are misleading. Most of these grant kit websites are actually web pages that are created with the purpose of capturing your personal contact information so they can sell or share it with third party marketing, advertising, and partner companies. The questionnaire found at Grant Approval 360, for example, is actually a series of questions intended to get you to try and sign up for other services so their partner companies can attempt to sell you things, like credit reports. The truth is that the Federal government has a free, comprehensive, informational site that can address all your questions regarding grants, the application process, and their availability. You can find everything you need at Grants.gov.